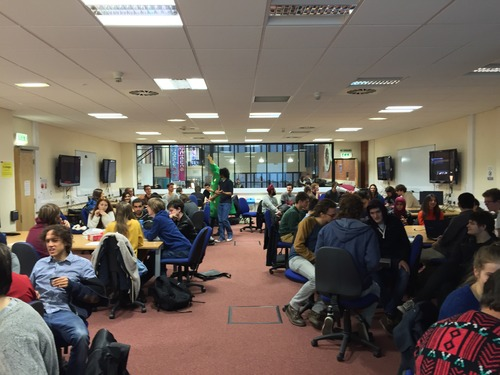 PASS is a student mentoring scheme in which second and third year students run informal study sessions for first and second year students. The aim of the scheme is to support undergraduate students who are moving into independent study for perhaps the first time. PASS in the second year more focuses on building skills which make the students stand out to employers, but also providing academic support. PASS sessions provide an opportunity for students to seek help and advice from fellow students who have faced the same problems themselves. Why does the university offer PASS? 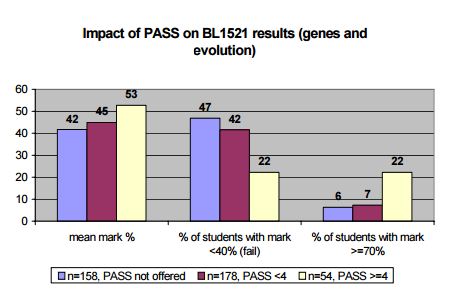 In 2005-2006, the Faculty of Life Sciences introduced PASS and, due to such a large cohort, PASS was offered to half the cohort in Semester 1 and half in Semester 2 in this pilot year. Therefore an experimental control group was created: those who were not offered PASS. The results presented are for 3 groups: those who were not offered PASS (Blue), those who could attend PASS but attended less than 4 sessions (Magenta) and, those who could attend PASS and attending 4 or more sessions (Yellow). Those who were offered PASS and went to four or more sessions on average performed 11% better than those who were not offered it. PASS 1 is a 1 hour session held every Wednesday at 12pm for all first year students. In PASS 1 students are usually in groups of around 15 with 2 or 3 PASS leaders. These sessions are all about you and what you would like help with. In these sessions the PASS leaders usually facilitate group discussions and activities that will help you with the sections of the course you want help with. However they are also there to support you with other problems you have such as giving advice about problems outside of class like second year accommodation. PASS 2 is a one hour session held once a week for all second year students. The format for PASS 2 is quite different to PASS 1 and focuses on building skills outside of the standard curriculum. Half of what an employer looks for in a student is their academic potential, the other half is their experience outside of university, and their passion for the topic. The second half hour is an open Q&A session, and is open for anything you want to talk about. If you have any questions about the scheme, please contact Gavin Donald or Andrea Schalk.